There are some games that can only be classified as masterpieces. Irrational Games is no stranger to such acclaim. In 1999, it was responsible for possibly one of the most atmospheric and truly chilling games ever made, System Shock 2. Then in 2007 came BioShock. Termed as a spiritual successor to System Shock 2, it recreated the best parts of System Shock 2, added in a fantastic setting and story and remains one of the most critically acclaimed games of all time. 2010 saw the release of BioShock 2, which was critically acclaimed as well, but not developed by Irrational Games. The eagerly awaited BioShock Infinite, announced in 2011 was finally released on February 26, 2013 after numerous details and boy is it good. It is in fact, a modern masterpiece and deserves every single bit of critical acclaim it has garnered. 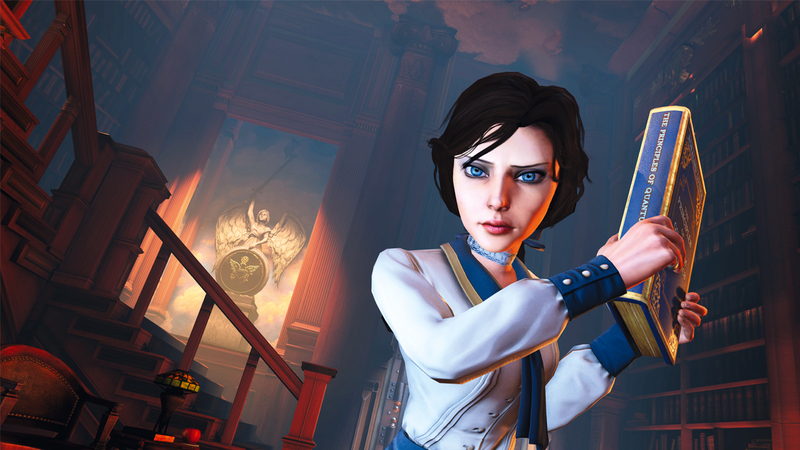 So read on for our full BioShock Infinite PC review to know more about the newest entry in the BioShock series! It’s 1912, and former Pinkerton agent Book DeWitt is sent to Columbia, a wondrous floating city in the sky to bring back a mysterious girl called Elizabeth to wipe away a debt. Columbia is home to an all almost all Caucasian population led by a man who is called the Prophet, Zachary Comstock. While on the surface it seems like an idyllic and almost perfect society, we quickly discover that this city has a sinister underbelly. Wracked by social evils like racial segregation and economic inequality, Columbia is far from the utopia that it claims to be. After meeting Elizabeth and freeing her from her prison in a tower, Booker realizes that she’s no ordinary girl. Elizabeth possesses the power to open “tears” in the environment, leading to different times and places. This power is used throughout the game to advance the story and is in fact what makes BioShock Infinite so absolutely riveting. Combining historical architecture and steampunk sensibilities, BioShock Infinite takes place in a world in which so many things are ideal and so many are far from it. During the course of the game, you witness the themes of socialism, capitalism and communism discussed and reflect in the events around you. There is a strong sense of American exceptionalism in BioShock Infinite, and Columbia is overshadowed by propaganda from Comstock’s faux religion which is a combination of fanatic Christianity and the reverence of American National heroes as deities. There are religious and political overtures in this game like in no other, and if you play close attention to the dialogue and everything going on, you’ll understand how much effort has been put into the whole setting. The story follows Booker and Elizabeth trying to escape from Columbia, chased by Comstock’s blind and overzealous followers as well as a faction called the Vox Populi, which calls itself the voice of the common man. Vox Populi, by the way, literally means “voice of the people” in Latin. I won’t elaborate on more of the story partly because it isn’t something I can entirely put in words and I don’t want to say anything to spoil it. Slowly you will find out what everyone’s true intentions are, why everything is happening and what is to be done. Everything builds up to an absolutely staggering and mindblowing ending that will be remembered as one of the best in gaming history. The final minutes, entirely dedicated to narrative ties up so many loose ends in such a small amount of time, and the denouement is absolutely pitch perfect. Even if you have no interest in shooting through all of the game, play it on easy, but finish the story. It’s worth it. 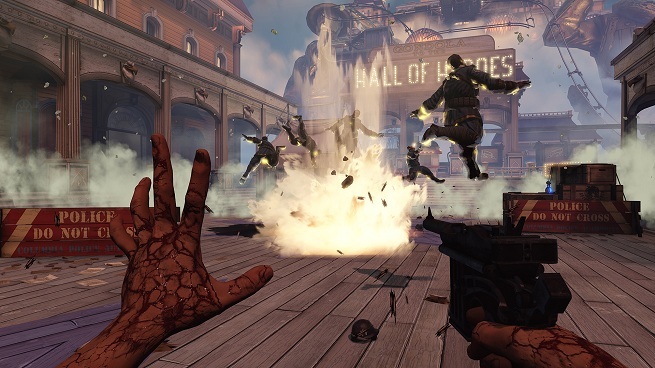 BioShock 1 and 2 players will find themselves right at home in Infinite. Employing the same model of guns plus special powers that were originally called Plasmids in the previous games, BioShock Infinite won’t take too long to get used to. This time around, the special powers are called Vigors. These powers let you demolish your enemies with ease or turn a hostile machine like a turret to your side. Using these powers require something called Salt, a commodity found in bottles around the game as well as dropped by enemies. It’s mostly a narrow shooter with no alternate paths, but trust me, your’e never going to miss alternate paths. Early on in the game you get Elizabeth as a companion, who isn’t the usual damsel in distress. She will open tears in the environment to produce cover, turrets to help you or even guns and ammo. During fights she will also help you by tossing you ammo or Salt. Elizabeth isn’t going to ever require protection as such, and makes for an excellent companion during your adventures. The only addition to the gameplay is something called the Skyhook, which lets you latch onto rails for travel or hooks to reach higher places. It also doubles up as a melee weapon for some pretty gruesome takedowns. Hot on the heels of Merc Elite which had an amazing female protagonist, Elizabeth cements her place as one of the most fleshed out and affable NPC’s in a long time. She will help you in combat, she will help you by altering the environment and will even pick locks, but the real strength is the sort of emotional connection you feel with her. She has fantastic animations that really tell you how she feels, and the voice acting is par excellence. Elizabeth actually interacts with the world and offers her insights, which makes her seem like a real companion and not just a forced NPC. Kudos to the developers who opted not to make her into just another oversexualized female character, but an actual human like one. BioShock Infinite’s campaign will last you around 10 hours or so, and if you’re really particular about getting the audio logs called Voxophones and seeing all the little films on the Kinetoscopes it could be a little longer. They advance the story further and give you insight about the background and history of Columbia. BioShock Infinite’s strength lies in its narrative, which even though is set on a floating city, seems grounded in reality because of connections to real events like the Wounded Knee massacre and allusions to many more. You get an inkling that the society Comstock wants to have mirrors what Hitler wanted to have. I’ve said it earlier and I’ll say it again, BioShock Infinite is a masterpiece. It transcends the boundaries of how much impact a game can have and if anyone ever questions videogames being art, this will be at the forefront of the counter argument. It’s one of those games you really want to finish, one that really draws you into its world. 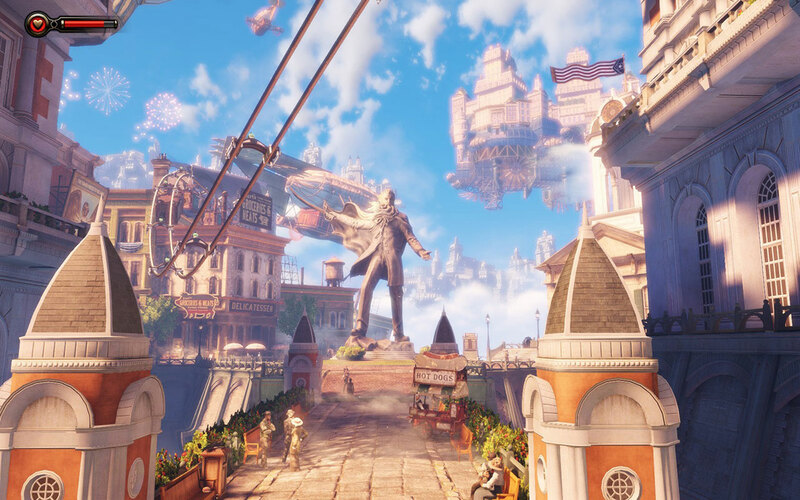 Speaking of which, even though BioShock Infinite has a fantastic setting, it mirrors so much of real life and history that it hardly seems like an escapist fantasy. BioShock Infinite has a multitude of complex themes and overtures that are hardly found in so many run of the mill shooters, it makes them seem almost puny in comparison. Be warned though, there are themes and events that might displease some, if not anger. It doesn’t shy away from showing religious extremism and its social commentary isn’t far from reality. Nevertheless, BioShock Infinite is an immensely enjoyable and mind bending game that you will definitely keep thinking about even after you’ve finished it. A second playthrough will reveal more clues than before and make the story even clearer, and if you love dissecting endings and events, Infinite should be on the top of your list. There are already many theories floating around about the game and quite a lot of them make an eerie amount of sense. 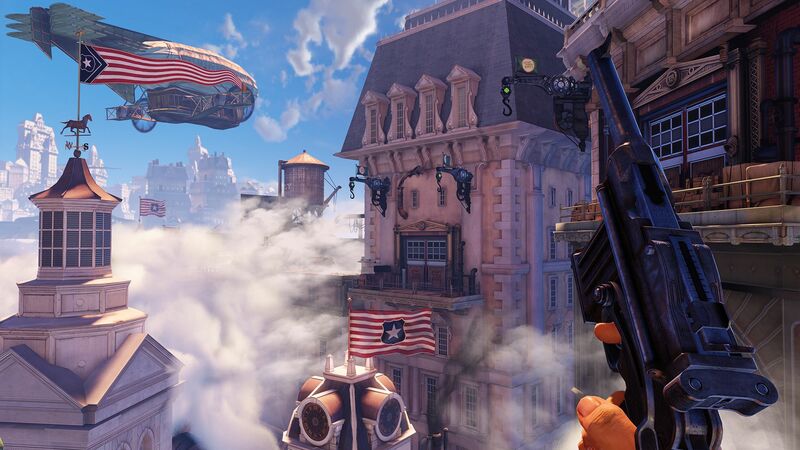 BioShock Infinite is the nearly perfect game you should get right now, it has to be experienced, not played.